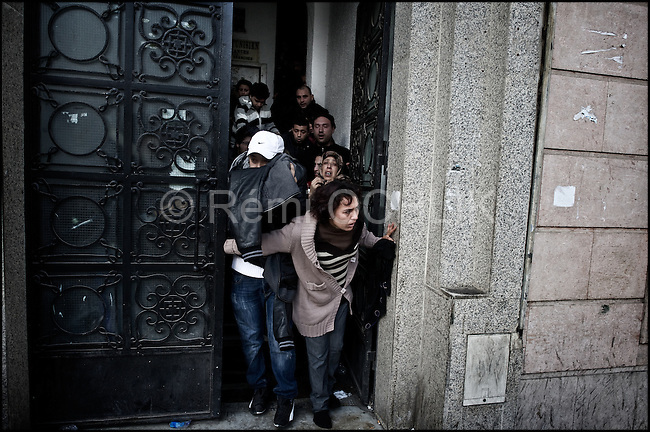 © Remi OCHLIK/IP3 - Tunis the 14 january 2011 - Tunisian demonstrator hide from the police and try to take refuge from the teargaz..Tunisia riots continued as President Zine El Abidine Ben Ali decided to dismiss his government following massive riots. The country's state news agency TAP says the president plans to call for new election in the next six months. Thousands of protestors took to the streets. The riots were sparked by high unemployment rates and a sagging economy as well as anger over government corruption. Tunisians enjoy little freedoms under President Zine El Abidine Ben Ali who has ruled a repressive regime for 23 years. Protestors ransacked buildings and threw rocks. Police used tear gas and gunshots to quell the crowd as protests got increasingly violent.